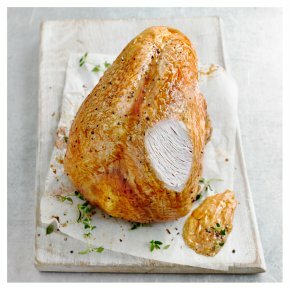 This delicious bronze-feathered turkey crown with prime wing comes sealed in a roasting bag so you can simply place on a baking tray and roast. Renowned for their rich flavour and succulence, bronze-feathered turkeys are a slower-growing breed, which means they tend to boast full-flavoured meat with a wonderfully firm texture. These birds are reared in either Lincolnshire, Yorkshire, East Anglia, Southern Ireland or Essex farms. Fed a natural, cereal-based diet, they have access to open pastures, meaning they range freely, coming and going as they please, just like our other free range birds. All this freedom, natural light and fresh air makes for a healthy bird and an especially tasty meat for your Christmas table.